After the unending ruckus about the Myphone Agua Vortex, Myphone's official Facebook Fanpage has given up and reveals its price and specification. Not so long ago Cherry Mobile also release its Cosmos Series which triggers the turning point in the Philippines mobile phone industry. Back to Myphone Vortex, brother of Myphone Iceberg, or maybe small brother, since Agua Vortex seems a little bit smaller in size compared to Iceberg. But the build and features are almost the same, maybe this release will target electronic consumers who doesn't like huge phones. Myphone Vortex will be featured with Clever Motion, similar to O+ Air shuffle, and Samsung's Smart Gesture. The process is simple, using your hands to wave without touching the screen will execute a specific command to the Myphone Vortex, the commands will include Wave to Dim, Wave to capture images, flip to mute, and clever dial. 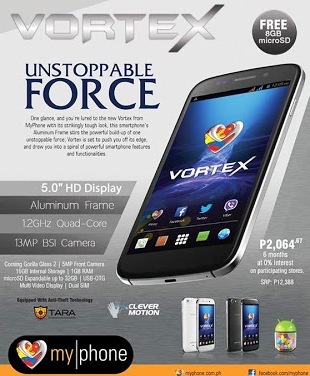 The Myphone Vortex will be priced at Php12,388 and comes with free 8GB MicroSD for free. Myphone has no word yet about its release date.